Pay a legal fee of $499. Complete online intake questionnaire form for HP Action. We prepare paperwork & prepare you for your hearing. You file paperwork with the clerk at the Housing Court and pay $45 court filing fee. You attend court pro se on the hearing date. 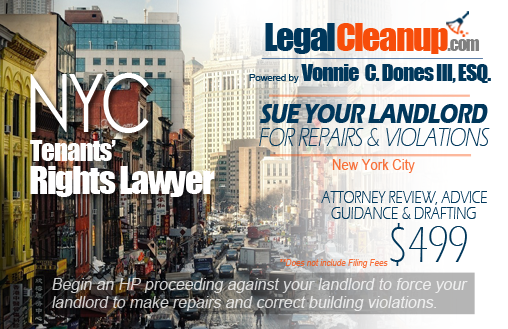 New York City Landlord-Tenant Lawyer Helping Tenants Sue Landlords For Repairs, Services, and Violations in HP Actions. For $499! Is your landlord refusing to make repairs to your apartment? Does your apartment fail to provide hot and cold water? Is your roof leaking or plumbing, electrical, or heating systems failing? Does your rental property have mold or a pest infestation? If so, we can help! You receive peace of mind knowing that you have an attorney handling your HP Action every step of the way. We will send your landlord a demand letter, contact the Department of Housing Preservation and Development (HPD) and/or other appropriate government agencies, and draft or complete the necessary paperwork on your behalf. windows that do not open or close or no window guards. Draft a demand letter for repairs or services and serve your landlord. Provide up to 2 hours of consultation preparing for your case and court hearing (gathering and organizing evidence for your case). Request an Inspection from HPD. Draft or complete Verified Petition and Order To Show Cause. Properly serve respondents (Affidavit of Service). In New York City, the filing fee for an HP Action in the New York, Bronx, Kings, Harlem, Queens, Richmond, and Red Hook Housing Court is $45.00. The mailing fees (certified mail return receipt requested) are $33.00, which is included in the $499.00 legal service fee. Please note that there may be additional copying and mailing fees depending on the circumstances of your case. If you would like for us to schedule a lawyer to appear, although not required, and represent you at your HP Action hearing in Housing Court, we can do so for an additional fee.